Four powerful LEDs strobe in varying patterns to provide almost any vehicle with road presence. A pivoting angle mount is secured to the windshield with four suction cups and a 3 ft. coiled cord extends to power the unit through any 12-24V unit. All metal construction ensures durability under repeated use and tough environments. Plug and play operation and easy removal make this an excellent choice for everyday safety. NuVue DOT-C2 Red/White Reflective Safety Tape Roll with 11" red / 7" white repeating pattern. 2" x 25' roll. Made from top grade commercial DOT-C2 approved tape and complies with Department of Transportation requirements. It dramatically enhances visibility at night, or in adverse conditions, when a light is shone at vehicle and is ideal for use on commercial vehicles, trailers or anywhere around the home or workplace where increased awareness to a hazard is required. NuVue Reflective Red High Intensity Safety Tape.1-1/2 x 8 Roll. Manufactured using high intensity prismatic technology with a typical brightness that is comparable to that of the DOT-C2 safety tape. Can be used anywhere increased visibility is required. Ideal for automotive, commercial or recreational vehicles. Can also be used around the home or work place to mark entrances/exits, steps, machinery or equipment. NuVue Red/White Barrel Stripe Reflective Safety Tape roll. 2" x 6' Roll. It is an engineered grade reflective material suited to draw high visibility day or night. The high intensity prismatic technology with a typical brightness is comparable to that of the DOT-C2 safety tape. Can be used anywhere increased visibility is required. Ideal for automotive, commercial or recreational vehicles. Can also be used around the home or work place to mark entrances/exits, steps, machinery or equipment. The LED Beaconz is an updated, modernized rooftop beacon. 36 high intensity LEDs flash in a multi-burst pattern to add visibility to almost any vehicle. Great for cars, trucks, SUVs, RVs, boats, tractors and more LED Beaconz features a paint-friendly rubberized magnetic mount for easy installation and removal. The cord stretches for ideal placement. Be seen, be safe. 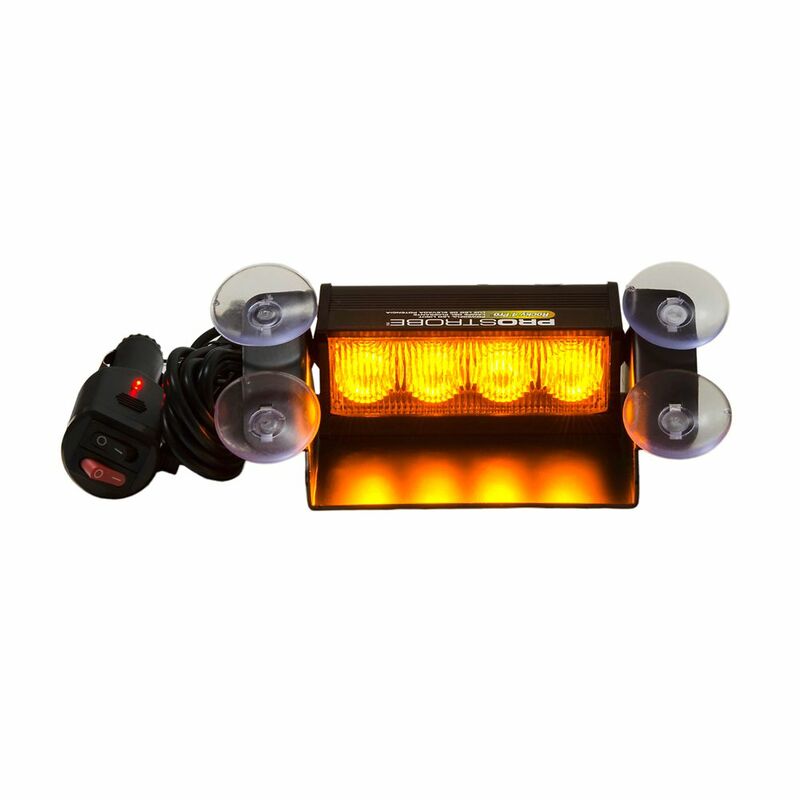 Rocky 4 Pro - Amber Four powerful LEDs strobe in varying patterns to provide almost any vehicle with road presence. A pivoting angle mount is secured to the windshield with four suction cups and a 3 ft. coiled cord extends to power the unit through any 12-24V unit. All metal construction ensures durability under repeated use and tough environments. Plug and play operation and easy removal make this an excellent choice for everyday safety. Rocky 4 Pro - Amber is rated 3.8 out of 5 by 4. Rated 4 out of 5 by VJ from Easy to install, easy to use.... Easy to install, easy to use. Rated 5 out of 5 by HomeDepotCustomer from Awesome love this product. This is capable of saving... Awesome love this product. This is capable of saving lives ..